My family and I recently spent a year in Hong Kong. Living in the New Territories rather than the crowded areas around the harbor offered a new and very different experience of Hong Kong that was focused on local Chinese communities rather than tourism. One thing led to another and I began sketching portraits of small business owners in outdoor street markets who work with their hands. They are resourceful in their ability to find creative ways to run their businesses, overcoming difficulties like limited space or resorting to setting up shop on busy sidewalks because they lack a proper store. 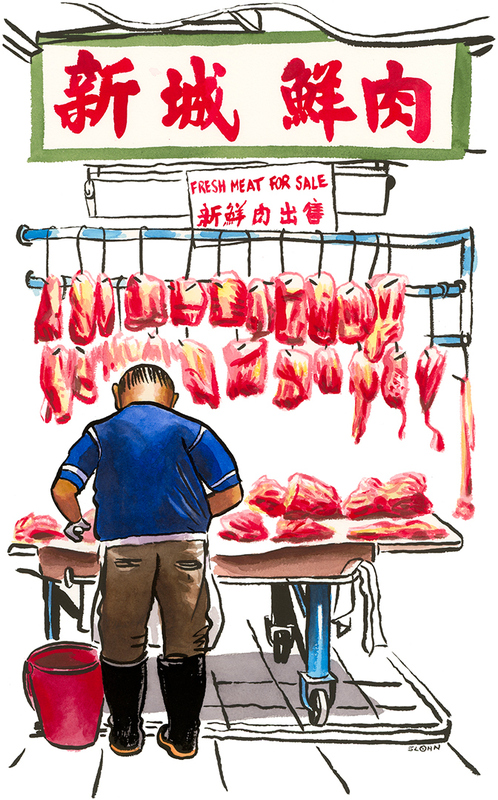 Butcher at Tai Po market, Hong Kong. This scene reminds me of growing up in Boston and visiting the Italian neighborhood in the North End where butchers hung fly-riddled rabbits and skinned cow's heads with bulging eyes from hooks in their storefronts. 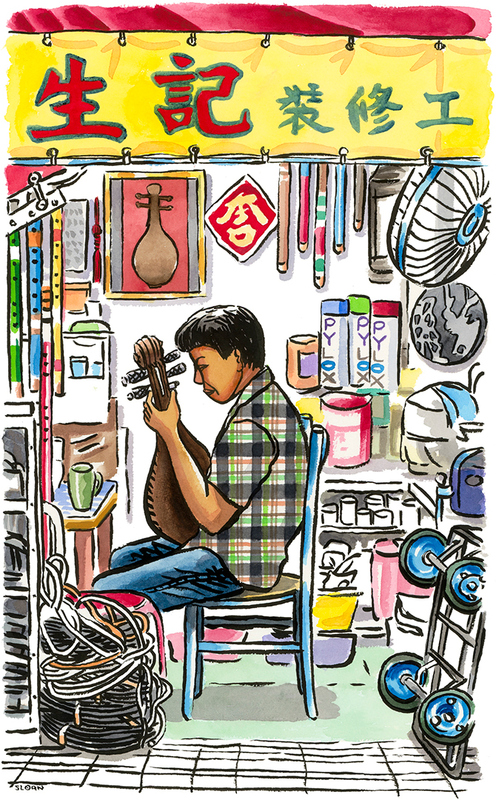 The Pipa player, Tai Po Market. 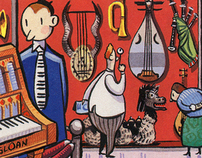 Surrounded by his equipment, the owner of this shop practices his Pipa, a Chinese string instrument, with complete absorption and concentration. He never looks up and seems oblivious to the two or three people like me who stand on the sidewalk enjoying his music. 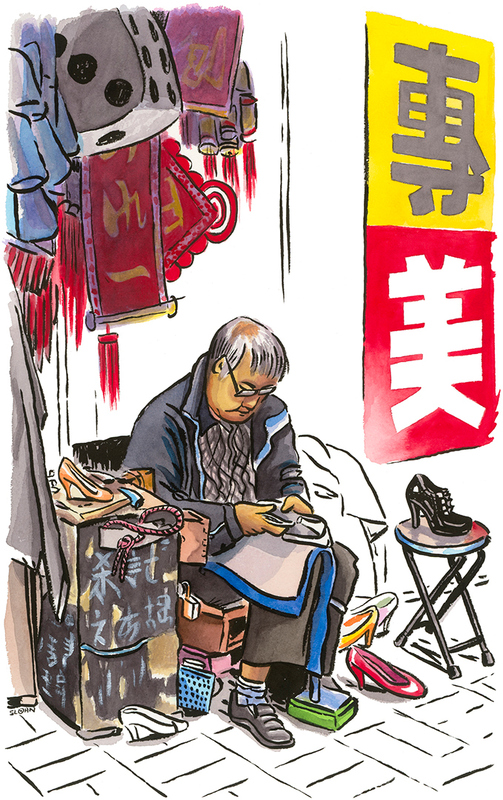 Shoe repairman, Mong Kok. This man sets up his shop on a busy public sidewalk sandwiched between entrances to an elevated pedestrian walkway, a store that sells holiday decorations, and the art store which I frequent. Fishmongress, Tai Po wet market. Locksmith shop near Queens Road Central. 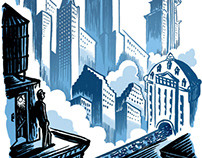 With space at a premium, Hong Kong residents are accustomed to living and working in tight quarters. A glimpse inside this store revealed all the tools of the shopkeeper's trade as well as comforts like a teapot, hotplate, television, refrigerator, and a stool. Fruit stands at dusk. 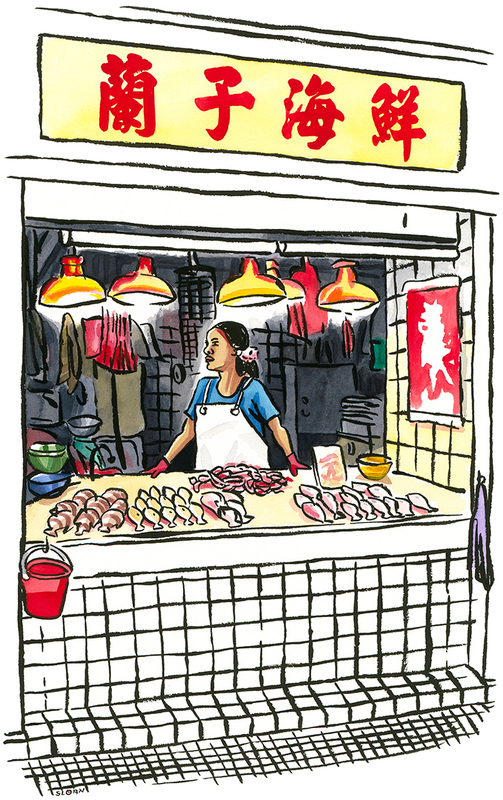 Tai Po market is another favorite place of mine to sketch in Hong Kong. The street markets burst with activity, noise, smells, and a large variety of products catering to the local Chinese community. There are fewer signs and restaurant menus in English in this neighborhood. Butcher in Sheung Shui street market. Sheung Shui is a town with thriving street markets in the northern New Territories and the last subway stop before the border with mainland China. 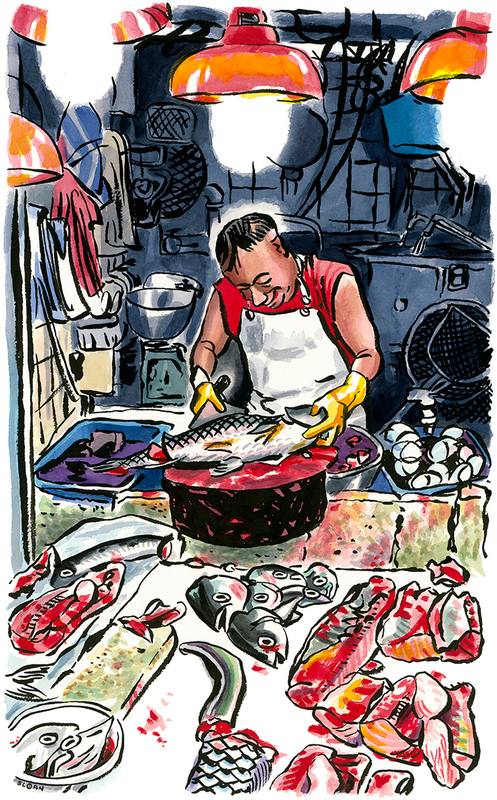 Fishmonger at his stall, Kowloon. Fisherwoman in her boat, Sai Kung public pier. Fresh fish are sold right from the boats that dock along the waterfront. 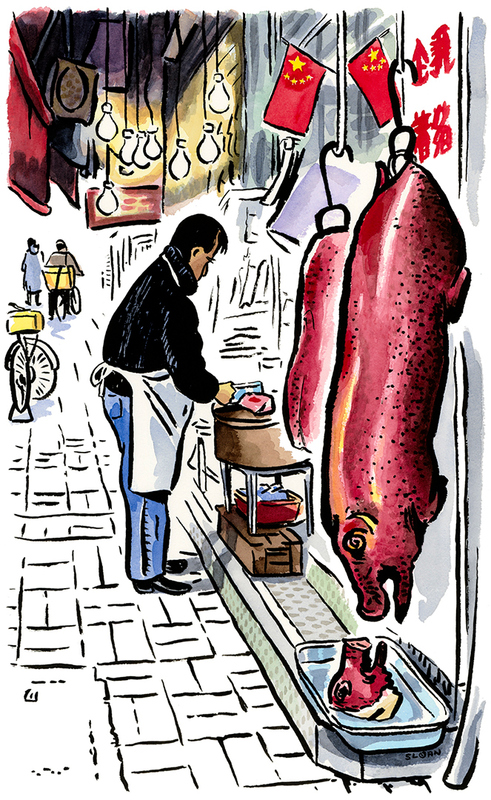 There’s usually a crowd of spectators on the pier watching the fishermen as they deftly cut up fish for their customers. 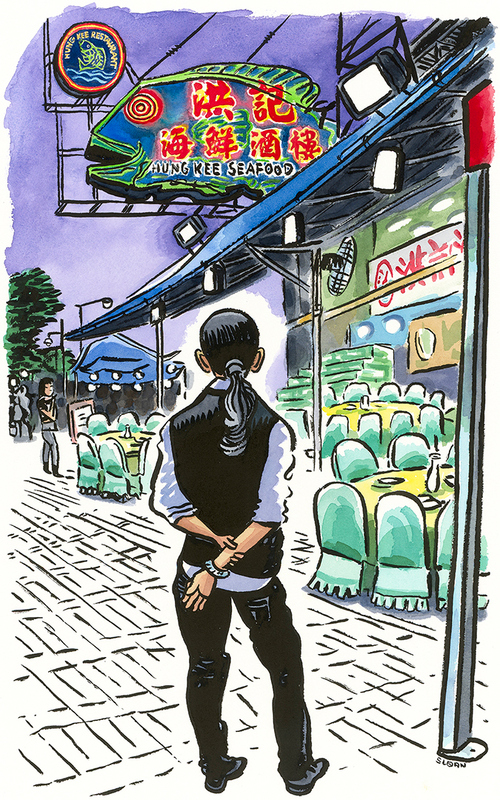 Waiter outside a waterfront restaurant in Sai Kung, 5:30 PM. By 6:30 all the tables will be filled, a throng of customers will be waiting on the sidewalk, and this waiter will have no time to stand still. Street scene at twilight, Sai Kung. Hong Kong was recently named one of the worst places on earth for light pollution, and neon signs like these contribute to the problem. I love these signs - they are such a part of Hong Kong's landscape to me, and some of them deserve landmark status. Fisherman repairing net, Sai Kung. I was attracted to the tranquility of this solitary man working diligently on a pier across the harbor from the crowded waterfront restaurants. A parallel trader waiting for the train to mainland China. These traders are Hong Kong and mainland Chinese citizens who shuttle across the nearby border with products purchased in Hong Kong such as infant milk formula that are scarce or whose quality is not trusted on the mainland. Advertisement in a Hong Kong subway car. This is one of many advertisements for luxury and fashion products that are displayed throughout Hong Kong’s public transportation system. Shoppers from mainland China at Shatin mall. Sidewalk poetry, Shanghai. The man was writing with water, so his characters began to evaporate within moments. By the time he had finished writing, the beginning of his poem had almost completely disappeared. Fa Yuen street market, Mong Kok East. I've often sketched from this vantage point on an elevated pedestrian walkway above the street, with the smells of stinky tofu drifting up from the food stalls below. Juice bar, Mong Kok. I'm a great fan of this neon sign that wraps around the corner so gracefully. The appetizing scent of fresh waffles and curried fish balls mingle with the putrid odor emanating from the stinky tofu stand a few doors down. News stand, East Tsim Sha Tsui. Cafe in Tai Po, early morning. 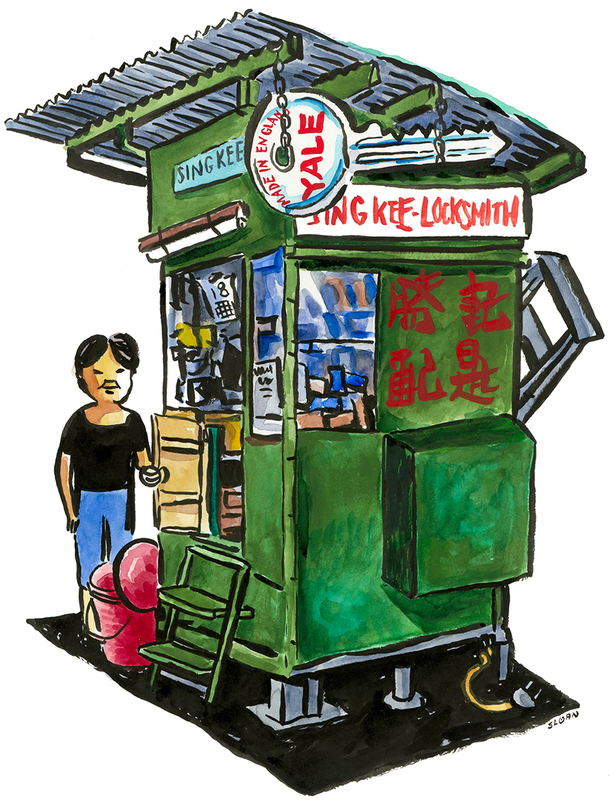 Tool repair shop, Tai Po. Lunchtime on Tung Choi Street, Mong Kok. 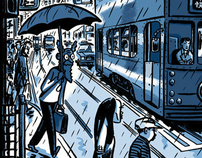 Red-roofed public light busses clog this street as their drivers visit their favorite lunchtime haunts. This scene reminds me of Lexington Avenue near 23rd Street in Manhattan, a neighborhood with many Indian restaurants that do a brisk business at lunchtime catering to NYC’s taxi drivers. Cobbler near Star Ferry terminal, Central. The harmonica player, Wan Chai. Tailor stall in an alleyway, East TST, Kowloon. Entrance to the engine room, The Star Ferry. My sketchbook work featured in Hong Kong's Mid-Levels magazine. 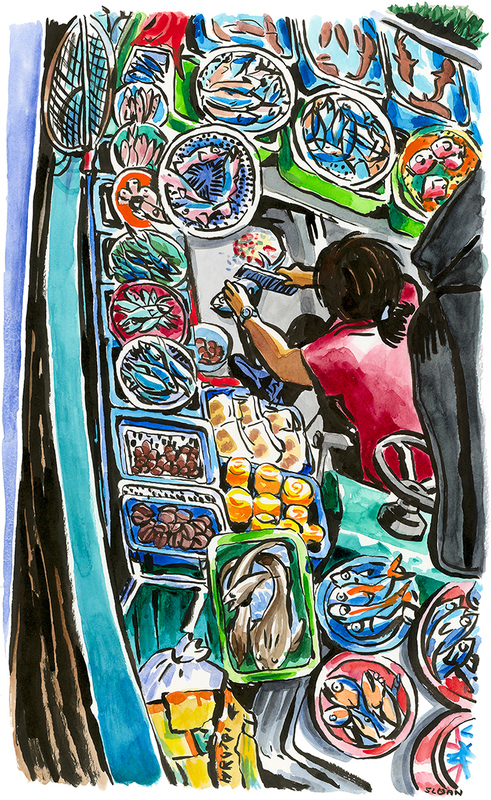 Paintings of local outdoor street markets completed while living and working in Hong Kong, one of my favorite cities in the world.